Some thinning hair treatments are associated with negative side effects that can compromise your overall health. Others merely address nutritional deficiencies, and that’s simply not enough. New research proves that hair loss is not caused by one thing, but by an accumulation of causes including inflammation, stress hormones, DHT hormones, and oxidative stress. Leveraging the latest in biotechnology, Nutrafol’s clinically-tested botanical ingredients are standardized to specifically address all of these triggers, to strengthen hair, and to nourish thinning hair from within. Sold by over 400 physicians nationwide (and counting! 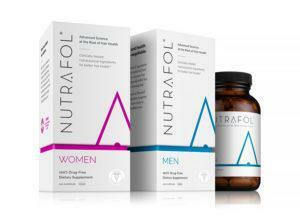 ), the doctor-formulated nutraceutical solution is designed to meet the specific needs for both men and women.